If you're attempting to take on Fortnite Battle Royale's weekly challenges, chances are you'll be on the hunt for the many ice cream trucks scattered around the large map. In this guide to the Fortnite Ice Cream Truck Locations we'll detail where you can find every ice cream truck, letting you easily complete one of the tasks in the Fortnite Week 4 Challenges. For more on Fortnite Battle Royale that isn't ice cream truck locations, head over to our Fortnite Battle Royale Tips Guide. We've also got a guide to Fortnite Battle Royale Season 3's Battle Pass. One of the more bizarre things you can find on the Fortnite Battle Royale map is ice cream trucks. There are loads, placed pretty evenly across the map, and these ice cream trucks play a major part in Fortnite's weekly challenges. While you only have to find five ice cream trucks in each Fortnite Battle Royale weekly challenge, many more than that are dotted around the map. If you're after all the Fortnice ice cream truck locations, we've got them detailed for you right here. Once you find an ice cream truck in Fortnite, all you need to do is wander over to it. Once you get close enough you'll see a celebration effect on-screen, indicating you've found one that counts towards your weekly challenge total. There's no need to perform any action at each ice cream truck location. Ice cream truck visits can be completed over numerous matches, but must be done during match conditions (so other players will be running around attempting to take you out). It's important that you see out each match in which you find an ice cream truck. You don't have to win the match, but you can't just quit out once you've found an ice cream truck. 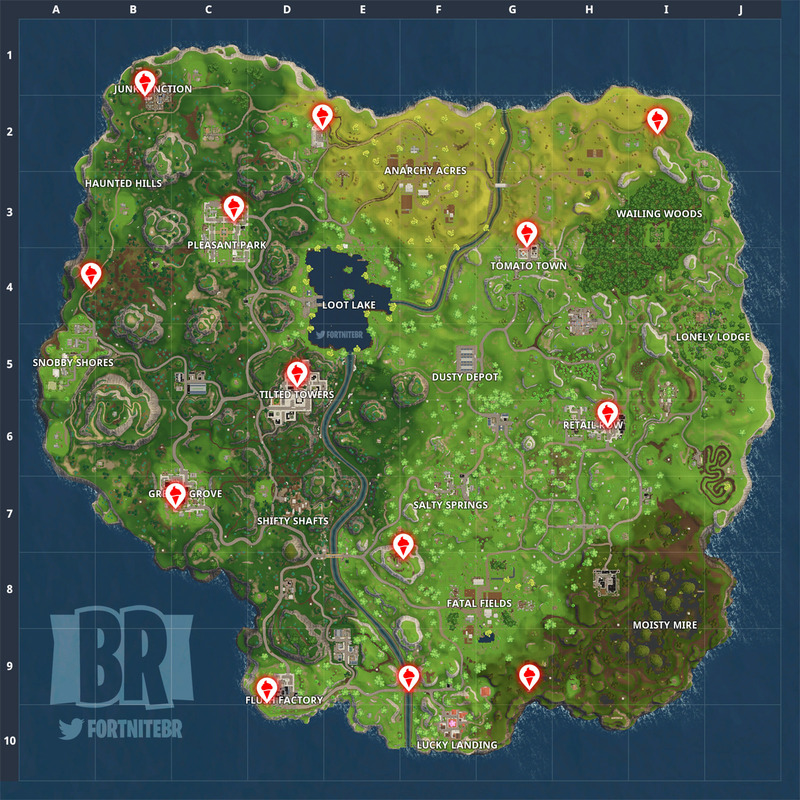 The map below, put together by imkairu on the Fortnite Reddit, shows all the ice cream truck locations you can visit for each Fortnite weekly challenge. Remember, you only need to visit five of these for each weekly challenge. With this handy guide to all the Ice Cream Truck Locations in Fortnite, you'll be getting closer to completing the Fortnite Weekly Challenge.